Glia account for over half of the cells in the human brain, yet compared to their neuronal counterparts little is known about their development, function and morphogenesis. 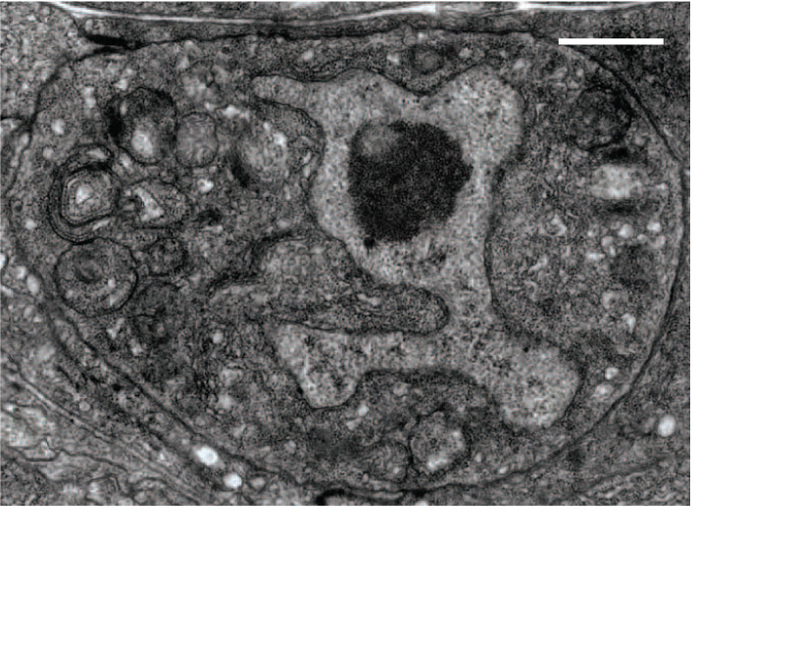 C. elegans contains neuron-associated cells that are strikingly similar to vertebrate glia. We are studying how these cells develop, acquire their morphologies and regulate neuronal activity using laser ablation, time-lapse microscopy, genomic and genetic approaches. Programmed cell death is essential for metazoan development. We study cell death in the nematode C. elegans, and are interested in understanding cues that regulate this process during development. We have identified a new cell death pathway independent of all known cell death genes, and have describes new ways in which the canonical cell death pathway is regulated. Electron microscope image of a dying C. elegans linker cell. Glial cell (green) associates with two neuronal processes (red) in the C. elegans phasmid sensillum.